Speedmonkey is all about cars. I've been running the site since 2012 and don't do it for money, but for the experiences it brings. 2014 has presented me with some amazing experiences. The year started well when Morgan Motors got in touch. The email said, "We would like to invite you to visit our factory in Malvern to get to know Morgan, the new 3 Wheeler and the other cars in our range." Oh wow, yes was my first thought. My second was that my son would love it. He'd enjoyed a trip to Lotus Cars in Hethel in 2013 so I asked if the visit could be arranged for half term. Of course it could replied Morgan. So son and I travelled up to Malvern. The factory tour was an eye opener. The land it stands on, in Pickersleigh Road, was bought by HFS Morgan in December 1913 and Morgan Motors has expanded and built new buildings to become the factory that churns out Morgan cars today. Actually, 'churns out' is a rather unkind phrase - the cars are hand-built. The term hand-built is rather stretched by some car companies but not so Morgan. I loved the fact the louvres on the Plus 8's bonnet are not only hand pressed but their placement is done by eye. The cars we drove were fantastically bonkers, especially the 3-Wheeler which is as impractical as an ashtray on a motorcycle. The engine vibrates, the cockpit is open and cold and there is no storage space but it is a wonderful experience and quite unlike any other car available. The Plus 8 was monstrously powerful and fast - It houses a 4.8 litre V8 yet weighs only 1,100kg. Son thoroughly enjoyed his day, and especially the drive in the 3-Wheeler. The passion for the brand was evident in the emails from legendary motoring journalist (and 3-Wheeler owner) Peter Dron who ticked me off for not conducting my own 0-60 times and from a chap who has bought the Plus 8 press car and has written his own review of it for Speedmonkey. The year was bookended with an invitation from Rolls Royce Motor Cars to attend a factory tour and drives in some of their cars. Rolls Royce was incorporated in 1904, just one year before Morgan, and still hand builds its cars today, at the Goodwood factory, which was opened on 1 January 2003. The Rolls Royce factory is worlds apart from Pickersleigh Road. Being only 11 years old helps but it has the atmosphere of a forensics lab, with men and women beavering away crafting, refining and ultimately creating the finest cars in the world. Which, when you drive them, you realise they are. What struck me about the Wraith and the Ghost II (both of which I took for a 90 minute spin) is not that are simply fast, enormous, luxurious, quiet, smooth and refined but that they both have another, almost ethereal, quality about them which transcends the usual driving experience. Close the door and pull away and you are separated from the mundanities of the world in a manner that no other car is able to do. Back to reality and a November appointment with Porsche at Silverstone to try out their 2014 range of cars at the newly extended track at their Experience Centre. I love driving road cars on track. You are able to really go for it and test the limits of braking, acceleration and cornering without worrying about the myriad hazards on our roads. It's also bloody good fun, especially in a Porsche. A track test allows you to find and critique the nuances of a car by pounding round the same circuit, the same corners time after time. It was after 20 or so laps of focussed driving I came to the conclusion that the Porsche Cayman GTS is perhaps the best driver's car on the road today. I took a Porsche Macan Turbo for a spin on track then a Macan S Diesel for a drive on the roads around Silverstone. Experiencing both conditions highlighted how focussed and agile the Macan's chassis is on track but how pliant and able to soak up bumps it is on the road. One of my favourite days of 2014 was spent in the company of Volvo and Polestar. I attended the UK launch of the Volvo V60 Polestar. We spent the morning driving through the home counties, lunched at a lovely pub near where I live then headed for Dunsfold Aerodrome, home to the Top Gear Test Track. I was given some expert tuition by a Swedish touring car ace then let loose on my own in the V60 Polestar for several laps of the track. The car proved to be wonderful and the thrill of driving it at the Top Gear Test Track is my fondest memory of the year. 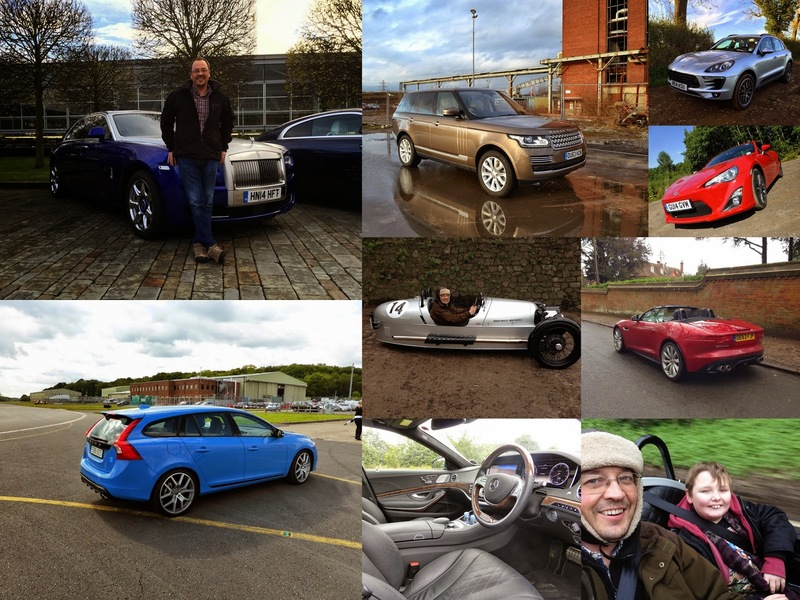 In between the factory tours and track tests I drove a variety of machinery in 2014. Back in May I attended a Mercedes-Benz media day at its base in Brooklands. I drove the GLA, G-Class and S. The GLA turned out to be far better than expected (I don't really like the A-Class on which it's based), the G-Class far worse (it's not a great deal better than a slightly posh Defender) and the S-Class was wonderful. I drove two Range Rovers this year. In January I had a Range Rover Vogue SDV8 for a week. It turned out to be the best all rounder I'd ever driven, although at £85k it's not cheap. Later in the year I had a Range Rover Sport SDV6 for a few days and used it to drive to Cologne and back with four of us on board. There could hardly have been a better car for the trip. It's spacious and utterly superb on a long journey. Does 135mph on the autobahn too. Staying in the JLR family I got a few days with a Jaguar F-Type V8 S. Damn that thing is unhinged. No other car flies so close to the spirit of a TVR than the V8 F. Just tickle the throttle and the tail pops out like a an excitable Jack Russell. The Citroen C4 Cactus was interesting in different ways. With its air bumps, shape, innovative materials, 965kg kerb weight and low price it's a brilliant car, although it is too slow for my liking. I liked the Cactus from the moment I first saw photos of it and over the course of a week it shone in a way that a similarly priced Fiesta or Corsa wouldn't. Taking of the Corsa I attended the UK launch. The 2014 version is shockingly good compared to its predecessors. The new 1.0 engine is a peach but the 2014 Vauxhall Corsa SRi is the one to have. The Subaru WRX STi was relaunched in 2014 and I was there to test it for Speedmonkey. The chassis is great but the engine and huge turbo-lag are far too old school when compared to the competition. For a similar price you could buy a Volkswagen Golf R which redefines the hot hatch class and for £25k you can buy an Audi S1 which is like the Golf R, but smaller. In amongst the SUVs, hot hatches, mega-expensive saloons and super-pricey sports cars I spent a week with a Toyota GT86. Now 2 years old the GT86 is still unique in its offering and still delivers razor sharp handling and an outrageously waggy tail for a reasonable price. My last test drive of the year was in a Maserati Ghibli. Sitting in the reception area of Ferrari North Europe was quite a thrill. The car itself was rather fine but didn't have an aura of 'special' that I expected from a Maserati. 2014 was a great year although at times I did feel a slave to the constant review writing (on top of a full time day-job). In 2015 I am going to turn down at least some of the invites that come my way and will be more selective when choosing press cars. Something like the Mitsubishi Outlander might generate hits to Speedmonkey but the week spent with it and hours spent writing about it were not much fun. The first car I will take delivery of in 2015 for a week long test is a Jaguar XFR-S. This will set the tone.